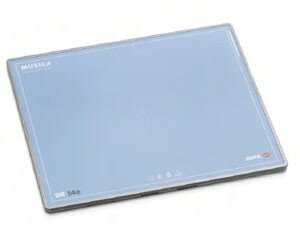 Lightweight yet robust, the DR 14e Digital Detector offers general radiography facilities all the advantages of Direct Digital, while maximizing the use of their existing equipment. The full-field Automatic Exposure Detection (AED) detector requires no electrical connection to the X-ray system, for seamless use with virtually all conventional and mobile digital X-ray systems. This allows the hospital to maximize its existing X-ray equipment investments. The light weight of the Rib Magnesium Alloy frame and the wireless technology enhance the operator’s comfort and improve exam flexibility, in a robust, aesthetically pleasing design. With its convenient 14x17-inch size, the DR 14e is ideal for all Genrad examinations.